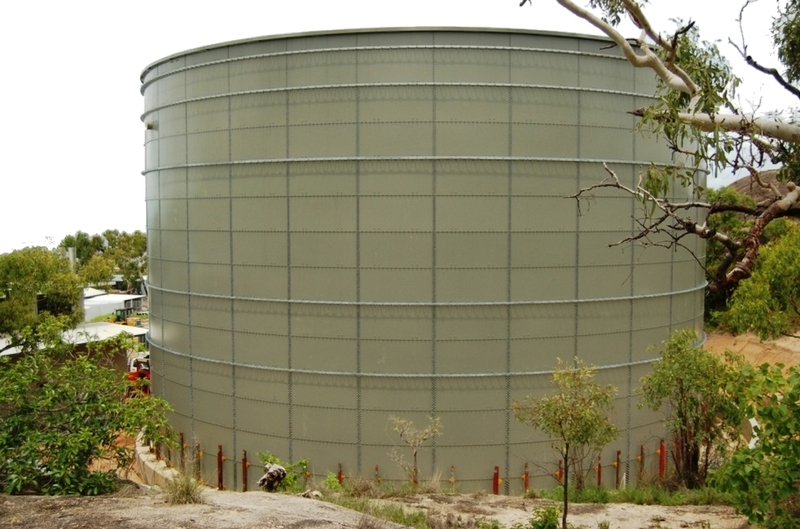 The design of bolted steel tanks to AS2304 is based on a limit states approach which represents a fundamental change in philosophy with respect to traditional tank design. In general, limit states and allowable stress design produce relatively similar results; however, the material savings afforded by the design of a bolted steel tank to AS2304 using a limit states approach are significant. Firstly, the hydrostatic load is considered a liquid pressure action and acquires a factor of 1.2 for the calculation of design stresses. Using a material factor of φ=0.9, the hydrostatic load is permitted to generate stresses in the shell up to 75% of yield (0.9*Fy/1.2). In traditional tank design, the maximum allowable stress is 66% of yield (Fy/1.5). When the bolts are taken into account, the difference becomes greater. In an allowable stress approach the hoop stress in the shell is calculated using the shell width less the sum of the bolt holes. The hoop stress is then compared to the yield strength of the material. In a limit states approach, the bolt hole area is also removed; however the calculated stress is compared against the factored ultimate tensile strength of the material. It is then possible to select the number of bolts such that they do not influence the design strength of the shell; whereas, in an allowable stress approach, this is not possible. The design of bolts also represents a significant change. The design strength of an M16, Grade 8.8 in shear is 29.9kN for an allowable stress design and 56kN for a limit states design. In the allowable stress design, the yield strength of the bolt is the governing factor; whereas, in limit states design the ultimate tensile strength of the bolt is the only consideration. It is noted that the loads from the limit states approach will be a factor 1.2 times greater than the allowable stress design, but this is much less than the ratio of 1.87 (56/29.9) for the two different bolt strengths. The design of tanks is also influenced by environmental loads that have the potential to force the designer to select thicker shell plates; however, notwithstanding this, the design to AS2304 has the potential to offer savings to tank fabricators and should seriously be considered for any new, bolted steel tanks.